This analysis was prepared by the Patented Medicine Prices Review Board (PMPRB) as part of the National Prescription Drug Utilization Information System (NPDUIS) and was done at the request and in consultation with members of the NPDUIS Advisory Committee. Appreciation goes to the PMPRB staff Tanya Potashnik and Elena Lungu for their oversight in the development of the analysis as well as to Brian O’Shea and Fatemeh Saberianranjbar for leading this analytical project. The PMPRB also wishes to acknowledge the contribution of the analytical staff Karine Landry, the scientific staff Dianne Breau, and the editorial staff. NPDUIS operates independently of the regulatory activities of the Board of the PMPRB. The research priorities, data, statements and opinions expressed or reflected in NPDUIS reports do not represent the position of the PMPRB with respect to any regulatory matter. NPDUIS reports do not contain information that is confidential or privileged under sections 87 and 88 of the Patent Act, and the mention of a medicine in a NPDUIS report is not and should not be understood as an admission or denial that the medicine is subject to filings under sections 80, 81 or 82 of the Patent Act or that its price is or is not excessive under section 85 of the Patent Act. Health Canada put forward a proposal in June 2018 to add tramadol to Schedule I of the Controlled Drugs and Substances Act (CDSA) and the Schedule to the Narcotic Control Regulations (NCR). This is intended to help prevent diversion and protect Canadians from the health risks of unauthorized tramadol use, while maintaining its availability for legitimate medical and scientific use. 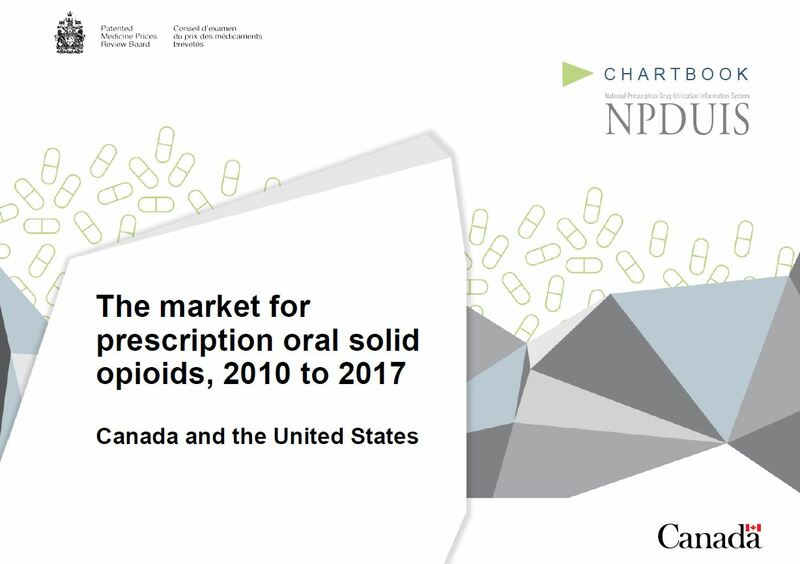 To provide an overview of the market for prescription opioids in Canada and the United States to inform discussions on the impact of the proposed regulatory changes. This analysis of prescription opioids covers only one aspect of a multifaceted health issue. The high-level statistics presented here are generally limited to the market for prescription oral solid opioids and the results do not capture the use of other formulations or the use of illegally obtained opioids in Canada and the US. While this reporting is designed to inform policies promoting safer opioid consumption, an analysis of the broader issues related to the opioid crisis such as opioid use disorders, the implications of opioid poisoning, and the illicit use of opioids, falls outside the scope of this study. The findings presented in this study are based on the analysis of a number of databases. The results pertaining to the Canadian national retail and hospital markets are based on data captured in the IQVIA MIDAS™ Database (all rights reserved). 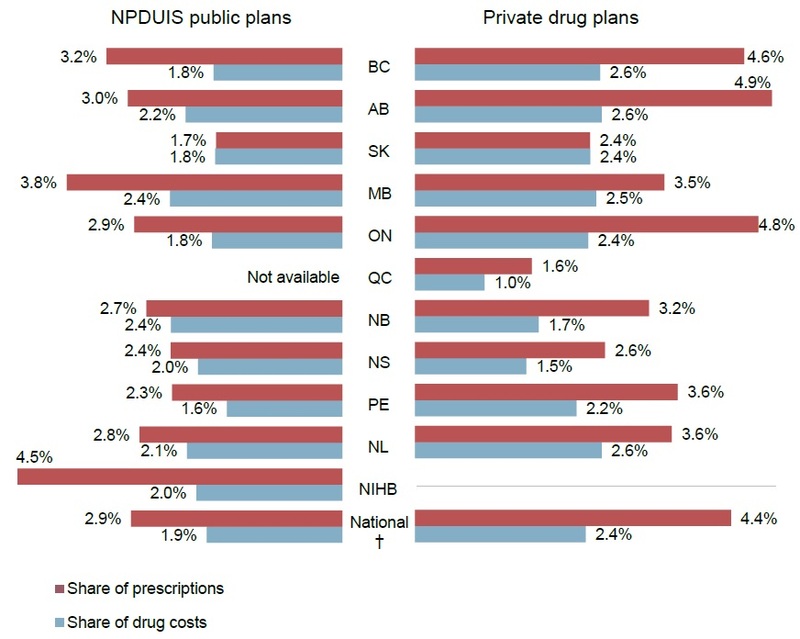 The NPDUIS Database from the Canadian Institute for Health Information (CIHI), consisting of public plan data from every province (except Quebec) as well as the Yukon and NIHB, was used in the analyses of the public drug plan market, while the IQVIA Private Pay Direct Plan Database was used in the analyses of the private drug plan market. CIHI private plan data for British Columbia was used in one analysis. The IQVIA Payer Insights Database provided information on the market breakdown by public, private, and out-of-pocket markets. For more information on these data sources, see the Source Materials document on the Analytical Studies page of the PMPRB website. Although based in part on data provided under license by IQVIA’s MIDAS™ and Payer Insights databases and by the Canadian Institute for Health Information (CIHI), statements, findings, conclusions, views, and opinions expressed in this report are exclusively those of the PMPRB and are not attributable to IQVIA or CIHI. This study focuses on the Canadian and US markets for the oral solid formulations of the prescription opioids listed below, including combination products containing the target medicines. For some analyses, oral solid formulations could not be isolated from the rest of the data, and thus, the results include all forms of each opioid. Physical units are a count of individual pills, tablets, caplets, etc. regardless of strength or formulation. Fully synthetic opioids such as fentanyl or methadone were not included in the analyses. This bar graph shows the morphine equivalency of the opioids included in this analysis. Morphine equivalents are a standardized measure used in this study to compare the relative potency of a milligram of each opioid to morphine. In 2017, enough oral solid opioids were prescribed to provide every Canadian with the equivalent of over 1 mg of morphine per day. The 419 MEQ per capita in 2017 represents an annual decline of 3.3% from the 529 MEQ per capita in 2010. This figure includes two bar graphs comparing morphine equivalents sold per capita in Canada and the United States. Results are given annually from 2010 to 2017, and compound annual growth rates are included for the period. CAGR: compound annual growth rate, 2010 to 2017. Data source: IQVIA MIDAS™ Database, prescription retail and hospital markets, 2010 to 2017. All rights reserved. 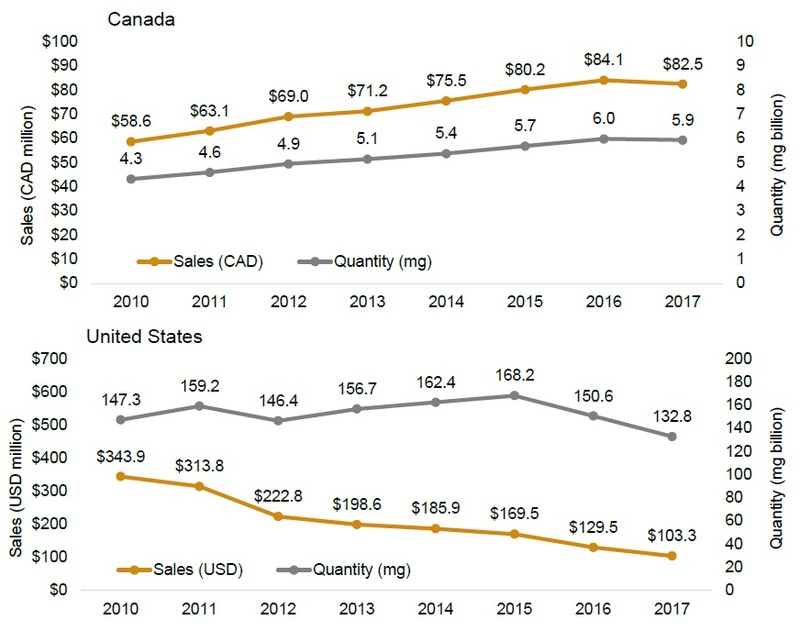 As measured by MEQ sold, the use of tramadol and hydromorphone in Canada grew at a compounded annual rate of greater than 4% from 2010 to 2017. Two line graphs give the sales of each of the oral solid opioids from 2010 to 2017 indexed to their sales in 2010. An accompanying table lists the total morphine equivalents for 2010 and 2017 in billions, the indexed results for 2017, as well as the compound annual growth rate for the full period. The first graph gives the indexed trends for Canada, and the second for the United States. 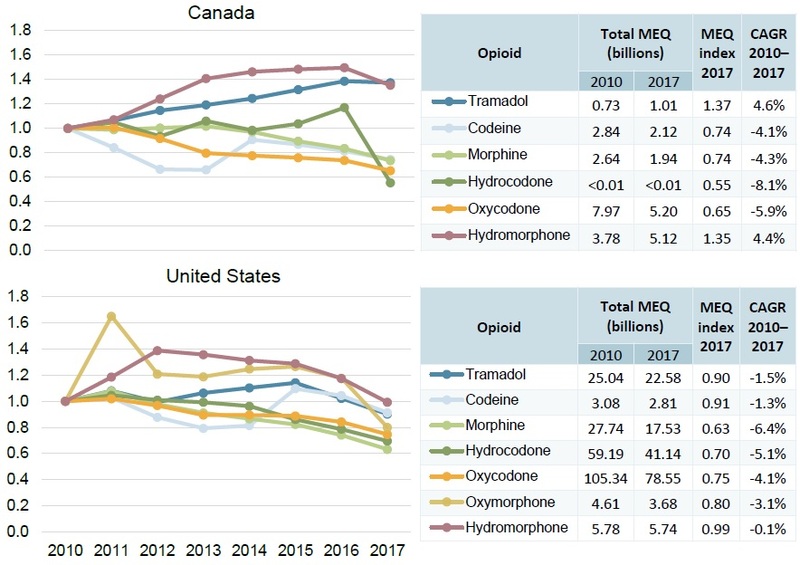 Tramadol, one of the least potent opioids, captures a relatively low share of opioid units and MEQ in Canada compared to the US; hydromorphone, the most potent opioid, accounts for a much more important share in Canada than it does in the US. 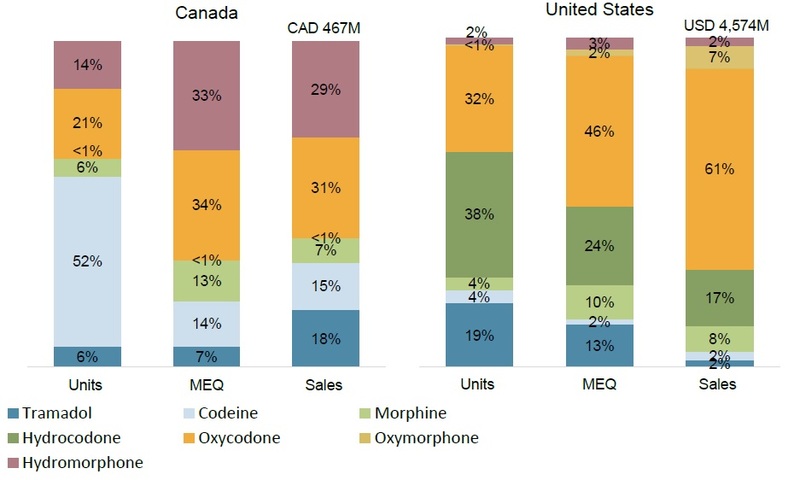 Oxycodone and hydromorphone accounted for most of the prescription opioid use (67% of all MEQ) and the majority of sales (60%) in Canada in 2017. In the US, oxycodone had the greatest use (46% of all MEQ), while the more potent hydromorphone accounted for only a minimal share. 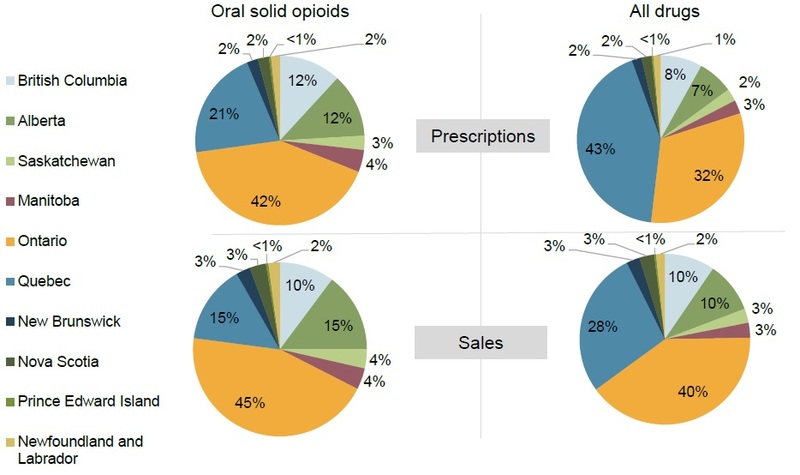 Two stacked bar graphs show the distribution of units, morphine equivalents, and sales for each of the oral solid opioids in 2017. Total oral solid opioid sales are also indicated. The first graph gives results for Canada, and the second for the United States. Data source: IQVIA MIDAS™ Database, prescription retail and hospital markets, 2017. All rights reserved. Hydromorphone’s market share in terms of MEQ increased from 21% to 33% between 2010 and 2017, while tramadol’s share has nearly doubled from 4% to 7% over the same period. Figures A1 and A2 in the Appendix provide similar information in terms of units and sales, respectively. 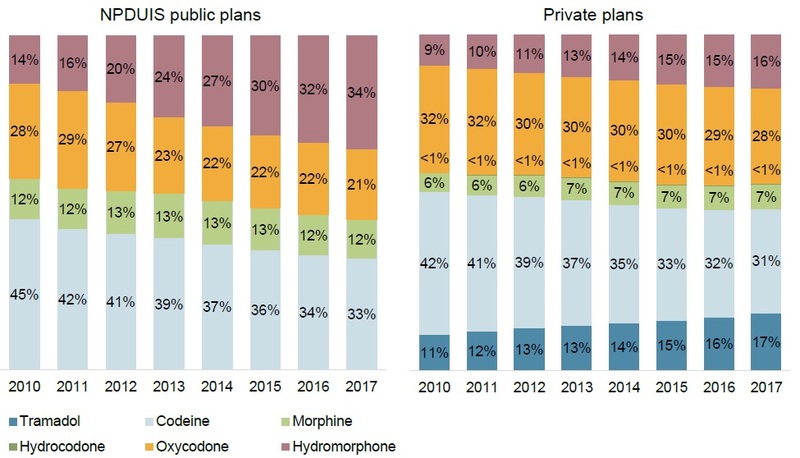 This figure consists of two stacked bar graphs, one for the market in Canada and the other for the United States, with information on the annual distribution of morphine equivalents by opioid from 2010 to 2017, as a percentage of total morphine equivalents sold. Data source: : IQVIA MIDAS™ Database, prescription retail and hospital markets, 2010 to 2017. All rights reserved. 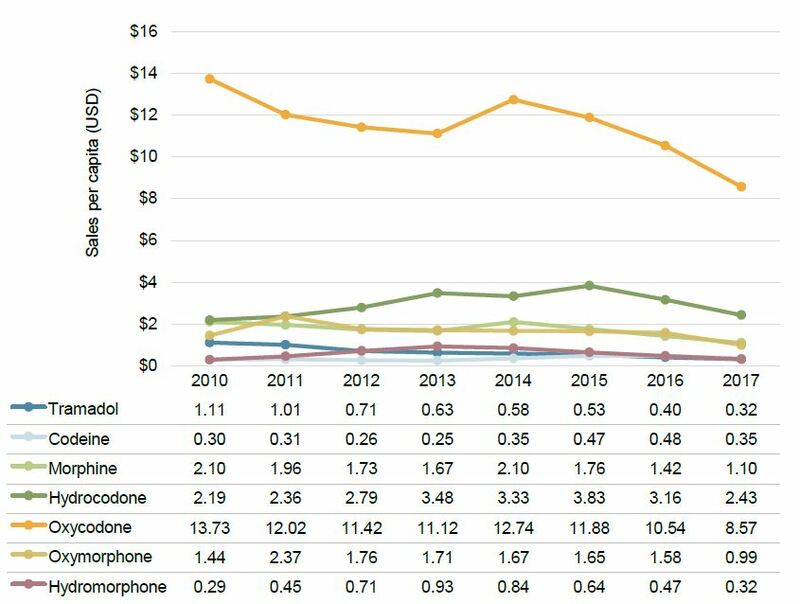 The average prices per milligram of codeine, morphine, and oxycodone were markedly lower in Canada than in the US in 2017, while the price of hydromorphone was higher. Despite generic availability, the price of tramadol was over 12 times higher in Canada than in the US. * Oral solid hydrocodone use in Canada is minimal and only covered by private plans. 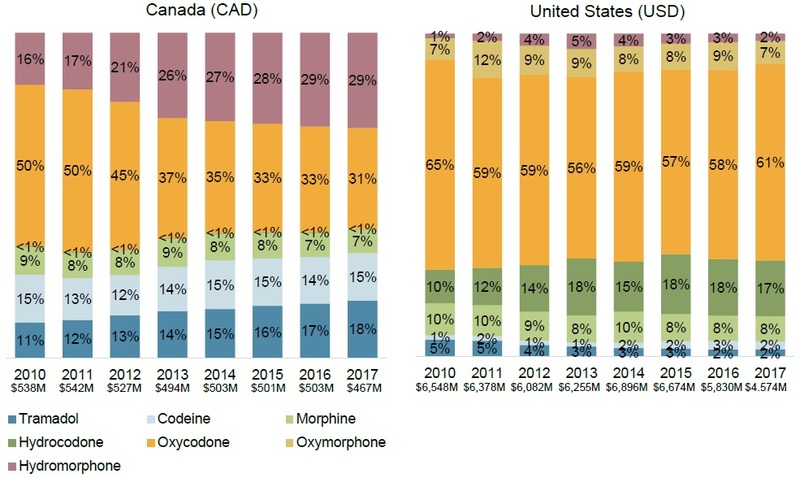 Canadian prices of the highest-selling strengths of codeine and morphine increased the most since 2010, with a compound annual growth rate (CAGR) of around 3%. 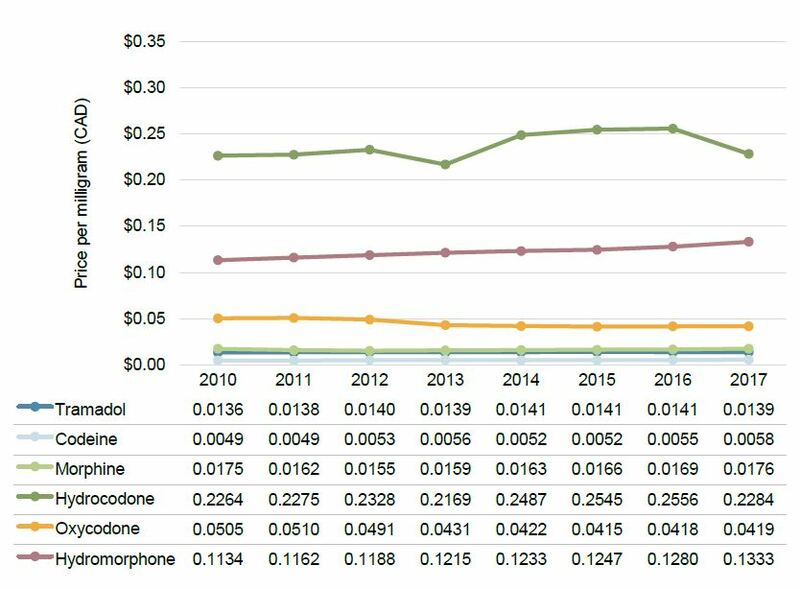 There was greater price variability in the US, with tramadol showing a steep decline in recent years. Generic versions were available for all opioids in the US, and for most in Canada. 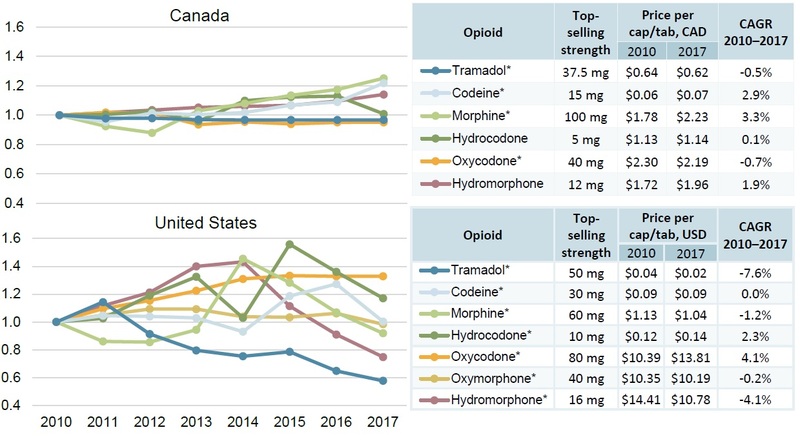 Two line graphs provide Canadian and United States price indices for each oral solid opioid from 2010 to 2017. Annual prices are indexed to the price in 2010, and are based on the highest-selling strength for each opioid. Accompanying tables give the compound annual growth rate for each opioid over the period, as well as the price per capsule or tablet in 2010 and 2017. Opioids with generic versions available are marked with an asterisk. Quebec accounted for 21% of national opioid prescriptions in 2017, whereas Ontario had double that share (42%) and British Columbia and Alberta each had 12%. 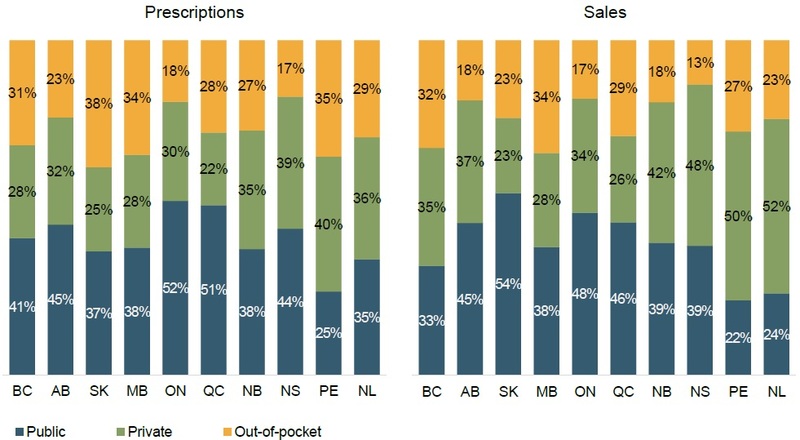 This figure consists of four pie charts indicating the distribution of sales and prescriptions by Canadian province in 2017. Results are given as a share of the entire prescription drug market, and as a share of the market for oral solid opioids. Data source: IQVIA Payer Insight Database, 2017. Includes retail sales in public, private, and out-of-pocket markets. In 2017, half of the prescriptions for opioids were paid for by private and out-of-pocket payers, at 27% and 23%, respectively. This figure consists of four pie charts indicating the Canadian market distribution of sales and prescription by payer type in 2017. Results are given as a share of the entire prescription drug market, and as a share of the market for oral solid opioids. 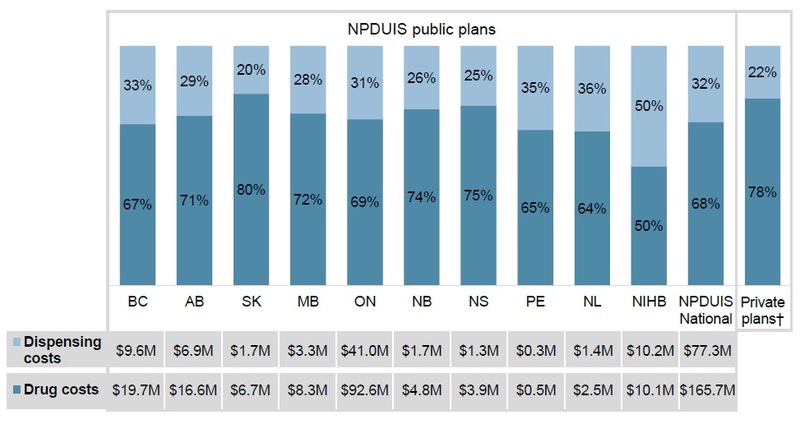 Ontario and Quebec were the only provinces where public plans were the first payer for the majority of retail prescriptions, at 52% and 51%, respectively. Two stacked bar graphs shows the distribution of oral solid opioid prescriptions and sales in 2017 by payer. Results are given for public, private, and out-of-pockets payers in each province. * NIHB prescriptions not included. As a percentage of all drugs, retail prescriptions and sales for oral solid opioids in Quebec were less than half the levels observed in any other province in 2017. 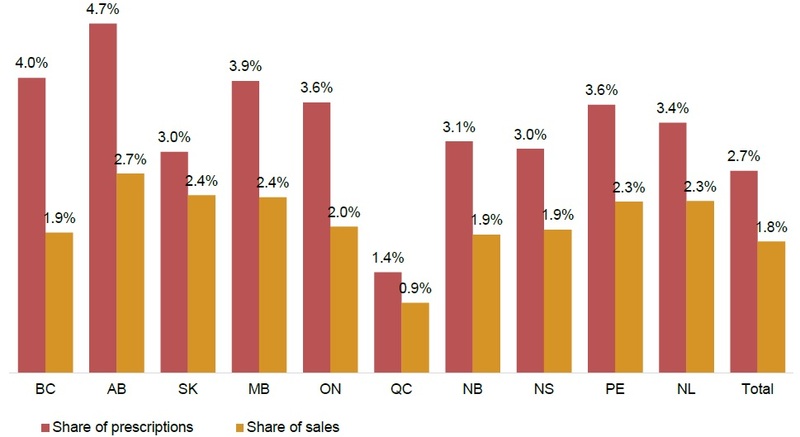 This figure consists of a bar graph with the 2017 share of retail prescriptions and share of sales for each province. Total results for all provinces are also given. The share of opioid prescriptions was 4.4% in private plans and 2.9% in public plans in 2017. 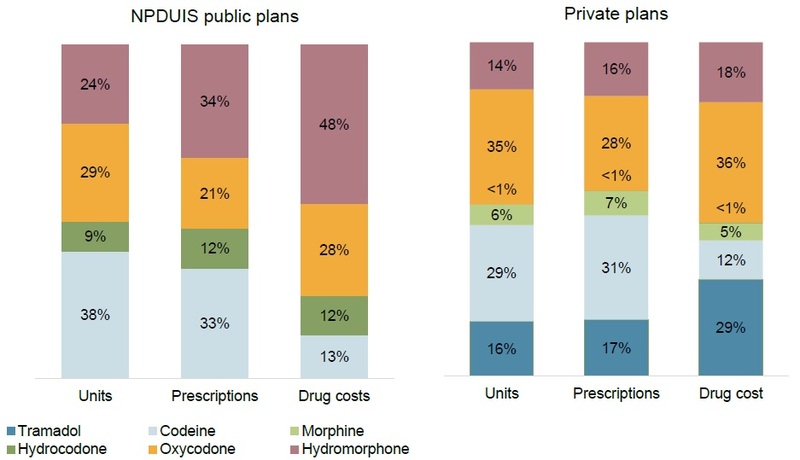 This “butterfly” bar graph compares the share of prescriptions and drug costs in public and private drug plans. Results for each are given by jurisdiction, and totals are included for jurisdictions with both public and private data in 2017. * Includes drug cost and markup. Dispensing costs are excluded. † Includes only the jurisdictions with both public and private data; NIHB (public only) and Quebec (private only) are excluded for these results. Data source: National Prescription Drug Utilization Information System Database, Canadian Institute for Health Information, 2017; IQVIA Private Pay Direct Drug Plan Database, 2017. Tramadol and morphine prescriptions in private plans have also been on the rise. Two line graphs with accompanying tables show the number of prescriptions for oral solid opioids from 2010 to 2017, indexed to 2010. The first graph models the results for NPDUIS public plans, and the second for private plans. Compound annual growth rates are also given for each opioid. Note: Public plans did not cover any oral solid hydrocodone between 2010 and 2017. Tramadol data in public plans is not reportable due to confidentiality requirements for small values. 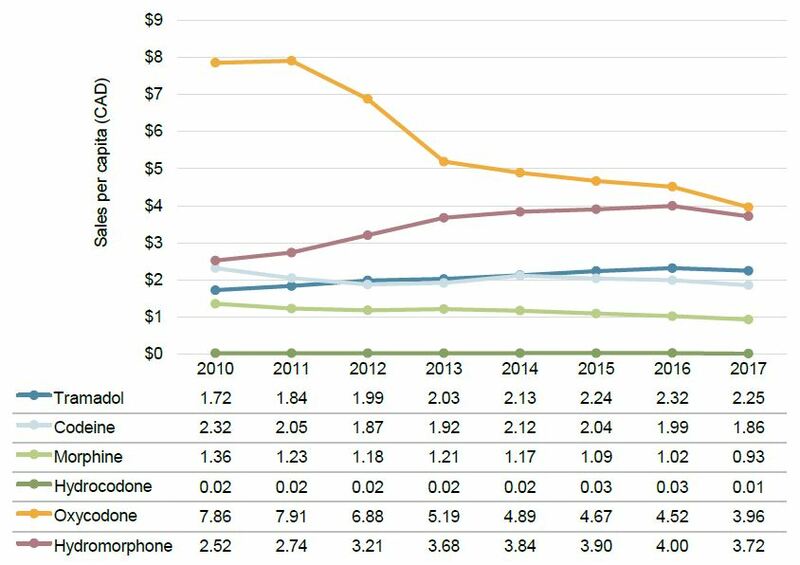 Data source: National Prescription Drug Utilization Information System Database, Canadian Institute for Health Information, 2010 to 2017; IQVIA Private Pay Direct Drug Plan Database, 2010 to 2017. 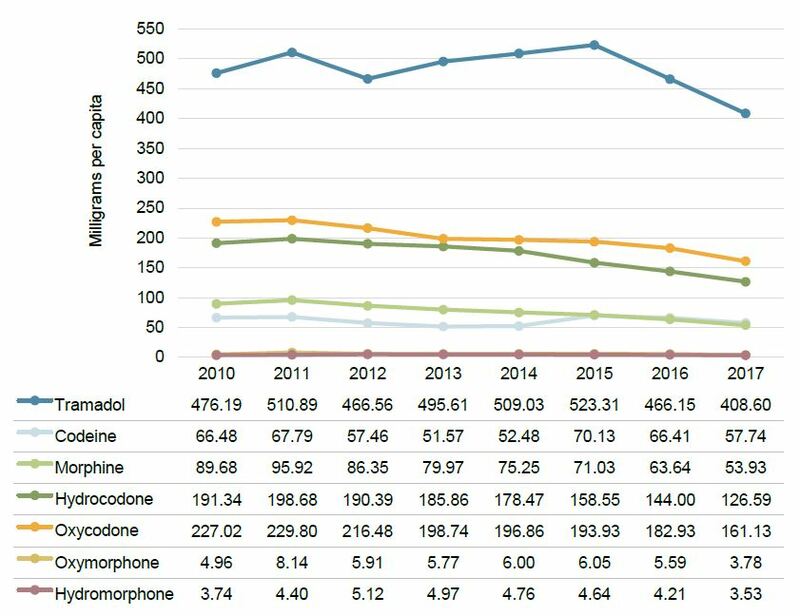 In private plans, the use of hydromorphone and tramadol grew steadily from 2010 to 2017, though codeine and oxycodone remained the market leaders. Figures A3 and A4 in the Appendix provide similar information in terms of units and drug costs, respectively. This figure consists of two stacked bar graphs depicting the distribution of prescriptions by opioid for each year from 2010 to 2017. 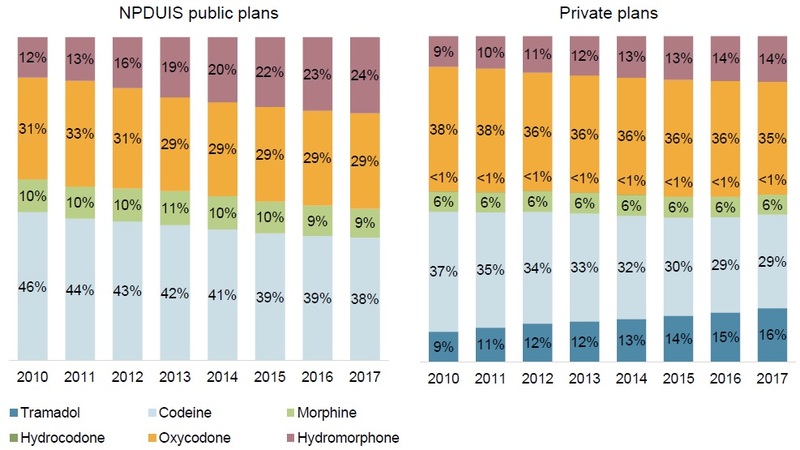 The first graph shows the results for the NPDUIS public drug plans, and the second for private drug plans. In private plans, oxycodone was still the leader in terms of drug cost followed by tramadol, while codeine was the most prescribed opioid. 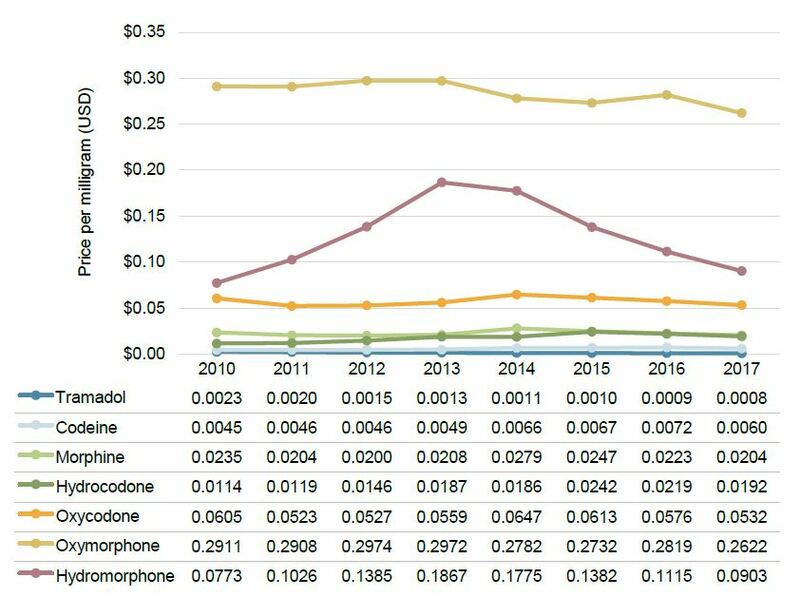 Two stacked bar graphs show the distribution of units, prescriptions, and drugs costs among oral solid opioids. The first gives the distribution for NPDUIS public drug plans and the second for private drug plans. No meaningful differences were observed in the distributions of opioids by gender. 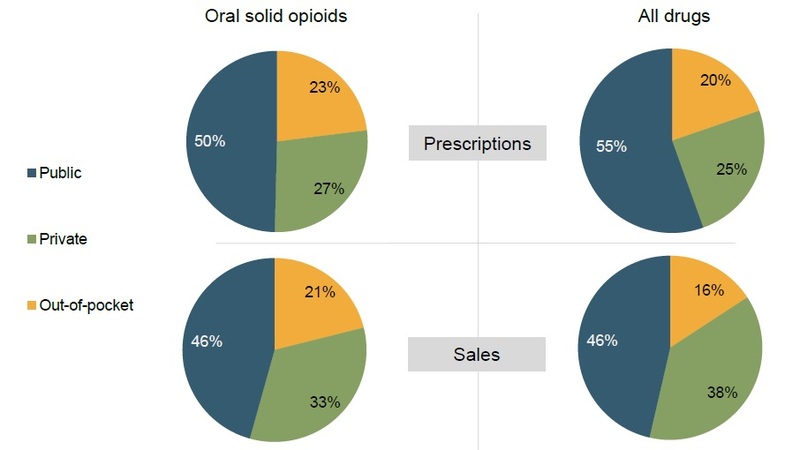 The four pie charts in this figure break down oral solid opioid prescriptions by gender as a share of prescriptions for all drugs and of oral solid opioid prescriptions. Results are given separately for NPDUIS public drug plans and private drug plans. * Results based on the NPDUIS public plans data pertain to oral solid opioids, while those based on private plan data include non-oral solid formulations. † Includes only the jurisdictions with both public and private data; data for NIHB and Quebec are not captured in these results. 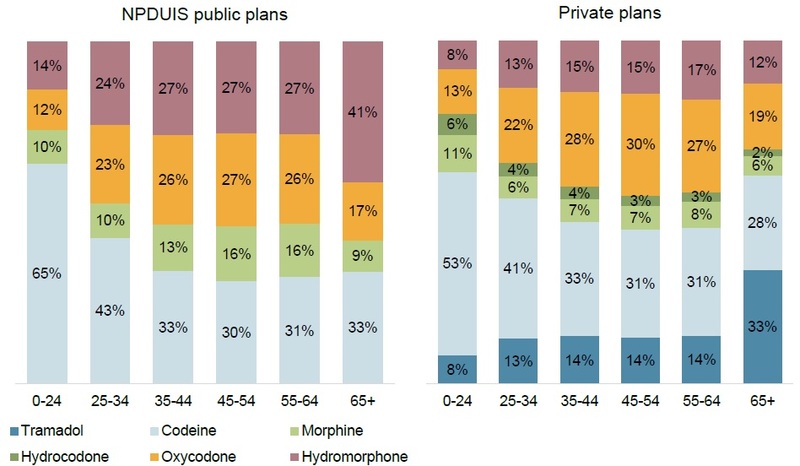 The data for private plans, which was not limited to oral solid forms, demonstrates a greater alignment between the shares of opioid prescriptions by age group and the shares for all drugs. This figure consists of two stacked bar graphs with information on the distribution of oral solid opioid prescriptions by age demographic in 2017. Shares are presented for each age group as a percentage of opioid prescriptions and as a percentage of all drugs. The first graph gives the results for NPDUIS public drug plans and the second for private drug plans. * The results based on the NPDUIS public plans data pertain to oral solid opioids, while those based on private plan data include non-oral solid formulations. Hydromorphone made up 41% of oral solid opioid prescriptions for patients 65+ in public plans. In private plans, tramadol was more commonly used by seniors than codeine, accounting for 33% of all opioid prescriptions, including those in non-oral solid form. Two stacked bar graphs show the share of prescriptions for each opioid by age. 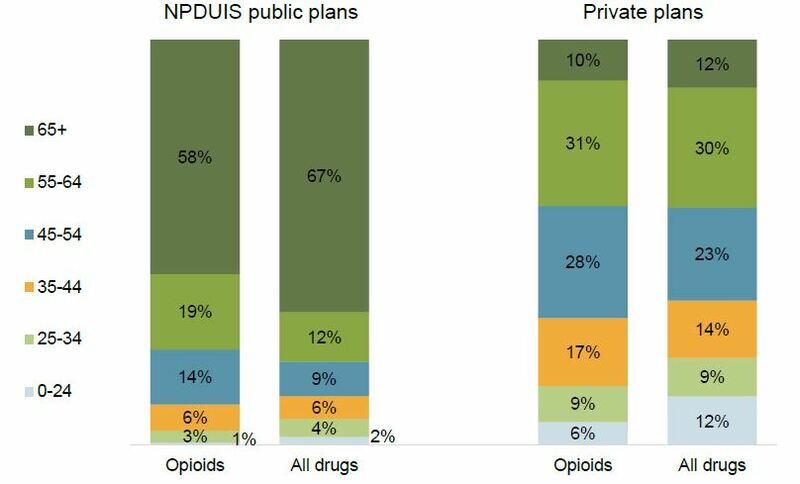 The first graph gives the results for NPDUIS public drug plans and the second for private drug plans. Jurisdictional variations in the dispensing cost share of total prescription costs may be due to a number of factors, including demographic and disease profiles, as well as the quantity dispensed with each prescription. A stacked bar graph shows the drug cost and dispensing cost shares of all oral solid opioid expenditures for the NPDUIS public drug plans in 2017. The graph gives the shares in percentages for each jurisdiction, as well as the share for the total of all NPDUIS public plans, while an accompanying table lists the corresponding expenditures in millions of dollars. A bar is also included with the shares for private plans. * Includes drug cost and markup. † Private plan average excludes Quebec for comparison purposes. Public plan beneficiaries paid an average of 15% of the total prescription costs for oral solid opioids in 2017, compared to 12% for private plan beneficiaries. Variations across jurisdictions may be due to plan designs and reimbursement policies, as well as the demographic and disease profiles of the beneficiary populations. This stacked bar graph shows the breakdown of oral solid opioid drug costs for NPDUIS public plans and private drug plans between plan-paid and patient-paid shares. Results are given by jurisdiction for the public plans and include total shares for all jurisdictions. An accompanying table presents the patient-paid and plan-paid amounts for each public plan in millions of dollars. * Private plan average excludes Quebec for comparison purposes. 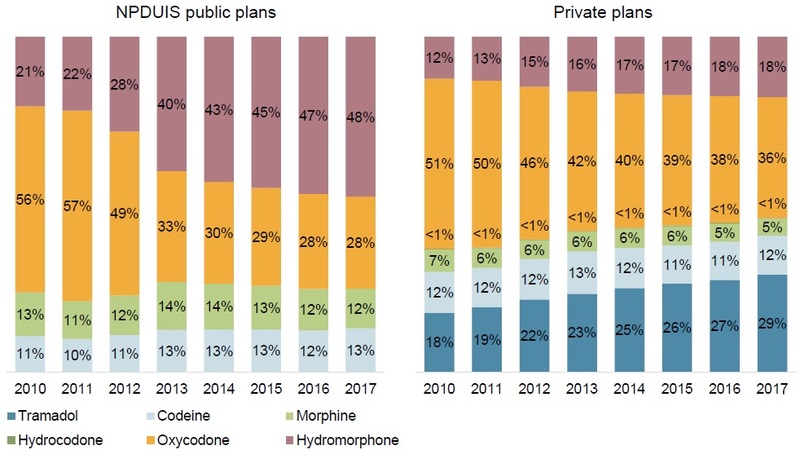 An analysis of public and private plan data shows that the strongest opioids had the largest per-patient cost decreases from 2010 to 2017: -26% for hydromorphone; -21% for oxycodone; and -43% for morphine. Tramadol also had a decrease of -9%, while codeine had an increase of 20%. A line graph illustrates the average drug cost per claimant in the British Columbia public drug plans. Results are given by opioid for each year from 2010 to 2017. * Results include both oral solid and non-oral solid formulations. Data source: Canadian Institute for Health Information, 2010 to 2017. 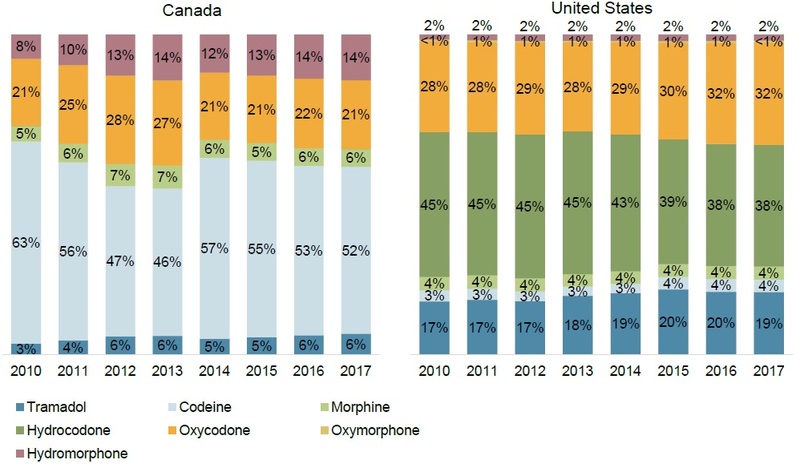 Two stacked bar graphs in this figure, for the Canadian and United States markets respectively, show the annual distribution of units by opioid from 2010 to 2017, as a percentage of total oral solid opioid units. 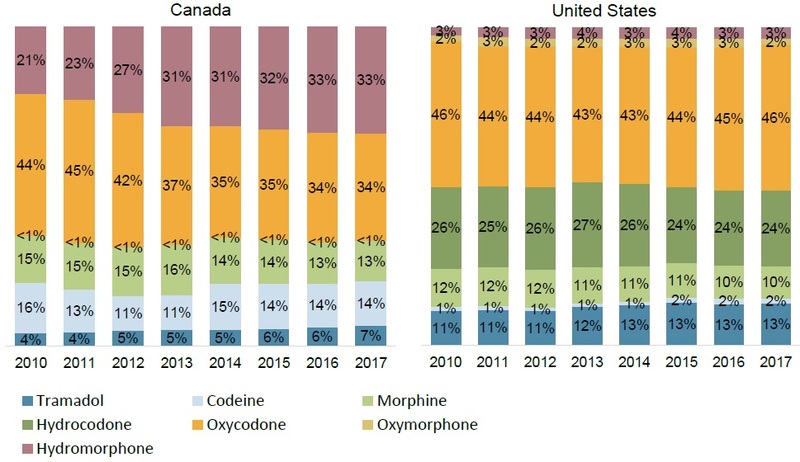 This figure consists of two stacked bar graphs, one for the market in Canada and the other for the United States, with information on the distribution of annual oral solid opioid sales from 2010 to 2017. Total sales amounts are also given for each year in millions of dollars. 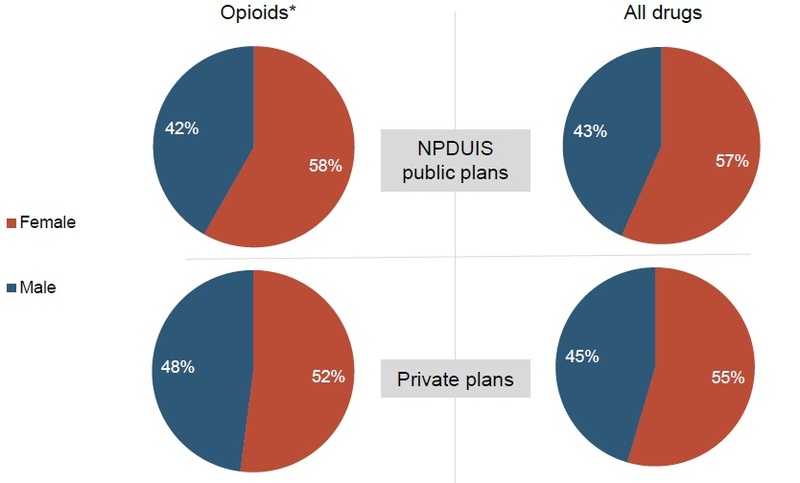 This figure consists of two stacked bar graphs, one for NPDUIS public drug plans and the other for private plans, with information on the distribution of physical units of opioids sold from 2010 to 2017. Results for each oral solid opioid are given as a percentage of total units sold. 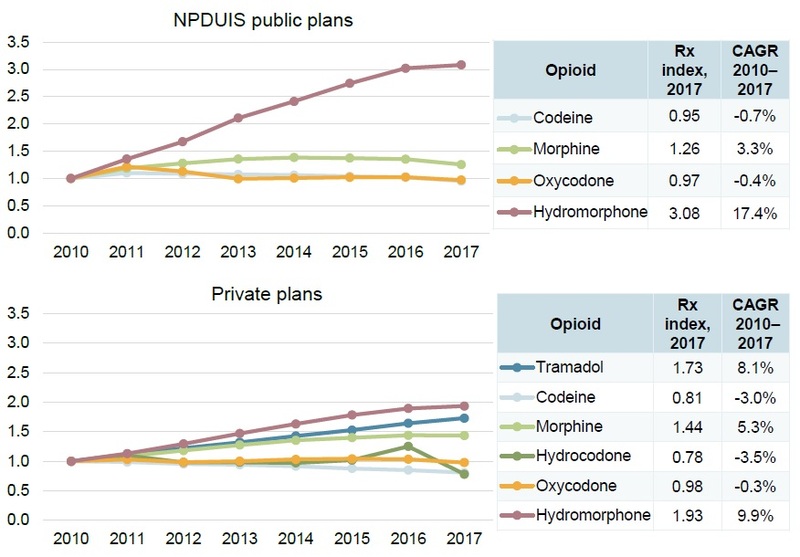 Two stacked bar graphs, one for NPDUIS public drug plans and the other for private plans, provide the distribution of annual drug costs among oral solid opioids from 2010 to 2017. Results for each opioid are given as a percentage of total oral solid opioid costs. * Includes drug cost and markup. Dispensing costs excluded. 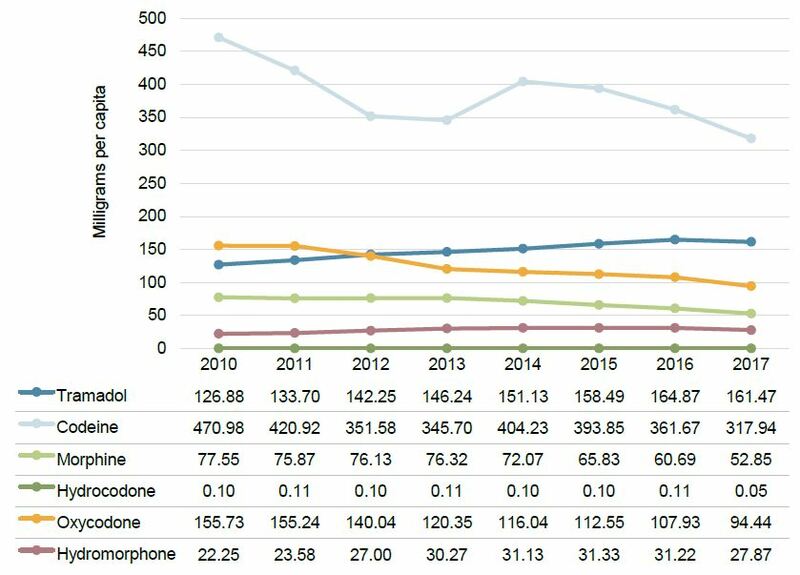 Two bar graphs show the total annual sales for oral solid opioids from 2010 to 2017. 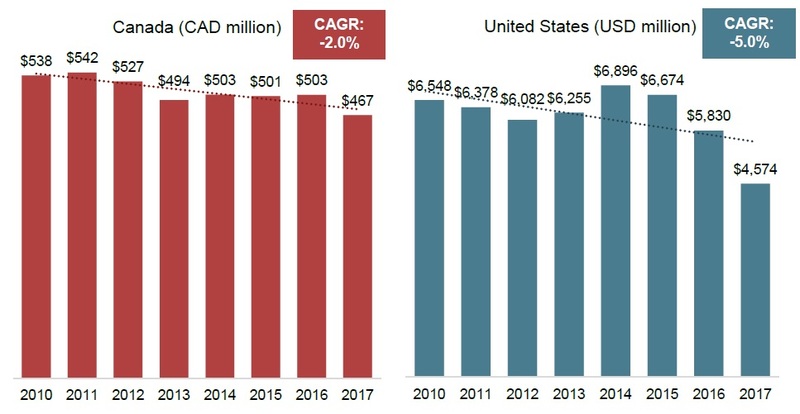 The first graph gives the totals for Canada in millions of Canadian dollars, and the second gives the total for the United States in millions of US dollars. A compound annual growth rate is also provided for each. Two line graphs measure the sales and units of tramadol sold in Canada and the United States. Results are presented annually from 2010 to 2017. Totals for units are given in milligrams. Sales in Canada are given in millions of Canadian dollars, and those in the United States are given in millions of US dollars. 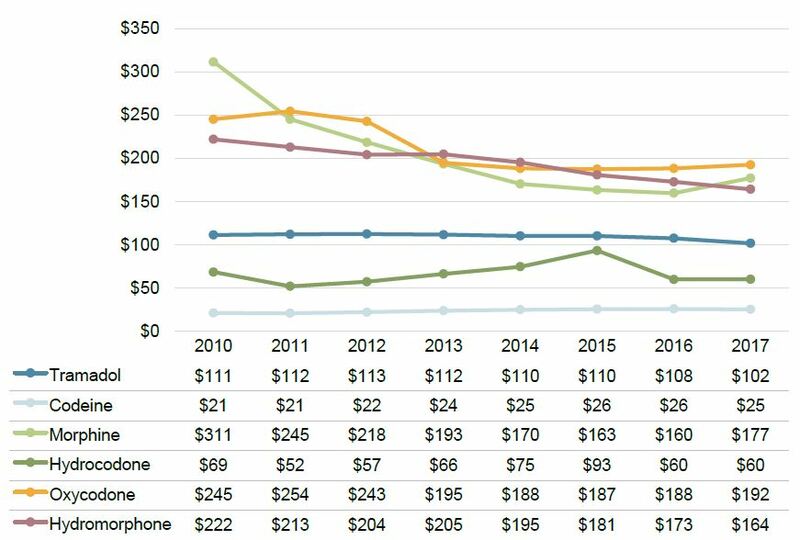 A line graph describes the trend in the average annual price per unit of oral solid opioids in Canada from 2010 to 2017. Prices are given in Canadian dollars per milligram for each molecule. A line graph describes the trend in the average annual price per unit of oral solid opioids in the United States from 2010 to 2017. Prices are given in US dollars per milligram for each molecule. A line graph describes the trend in Canadian sales per capita from 2010 to 2017. Sales per capita for each opioid are given in Canadian dollars, and are listed in a table below the graph. A line graph describes the trend in US sales per capita from 2010 to 2017. Sales per capita for each opioid are given in US dollars, and are listed in a table below the graph. A line graph describes the trend in the milligrams of oral solid opioids sold per capita in Canada. Milligrams per capita are given annually for each opioid with sales, and are listed in a table below the graph. A line graph describes the trend in the milligrams of oral solid opioids sold per capita in the United States. Milligrams per capita are given annually for each opioid, and are listed in a table below the graph.